I saw this film during its second week, b/c I wanted to wait until my lil bro was visiting. He said that “the first movie was slow,” an opinion shared by several friends/acquaintances of mine. My mom mainly went to see Richard Armitage (she’s a fan, too). I loved the LOTR films, so I continue to follow these films. SPOILERS: Don’t read further if you have not yet seen, or don’t want to know, details from this film. 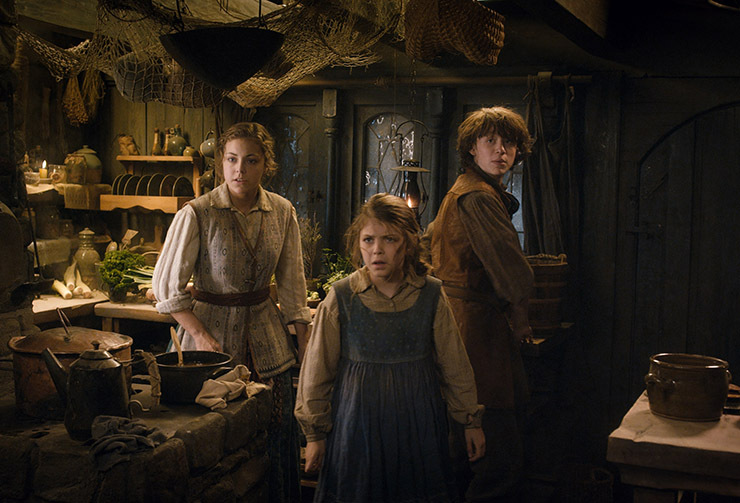 Bilbo becomes “a more rounded character” (Freeman’s words) in this film. He uses the ring (several times) to get out of jams, kills an orc (his first kill, I believe), and then faces off against a giant spider. 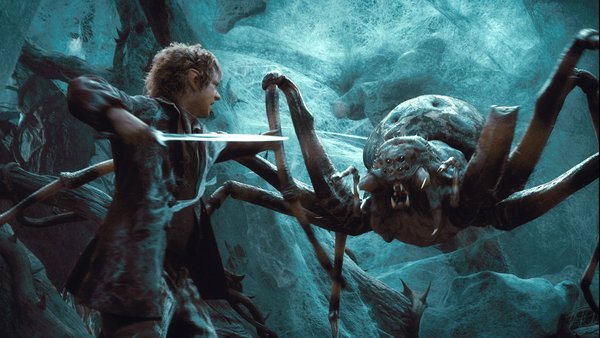 We see how his little sword, later bequeathed to Frodo, got its name- Sting. Gandalf goes off (again) to see the gathering evil in Dol Guldur. We hear the voice of The Necromancer (later known as Sauron), voiced by Benedict Cumberbatch. Yes, he is everywhere these days, and I’m not complaining! The dwarves go into Mirkwood Forest, which is not a friendly, cheery place like Rivendell. 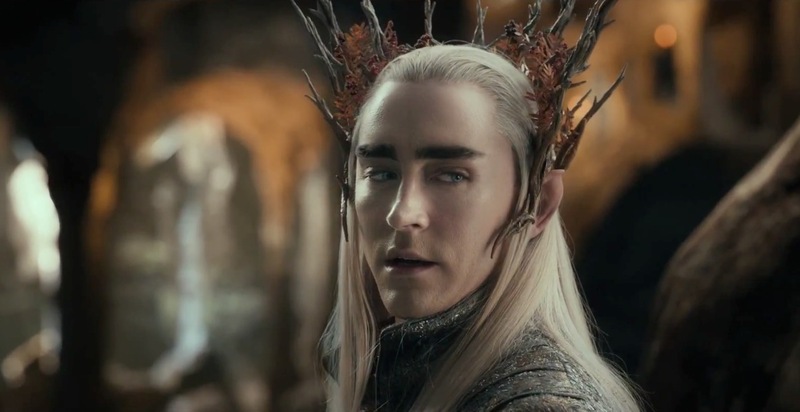 The king, Thranduil (Lee Pace), is a very interesting character; I wanted to see a bit more of him. He can do and say whatever he pleases in this realm. 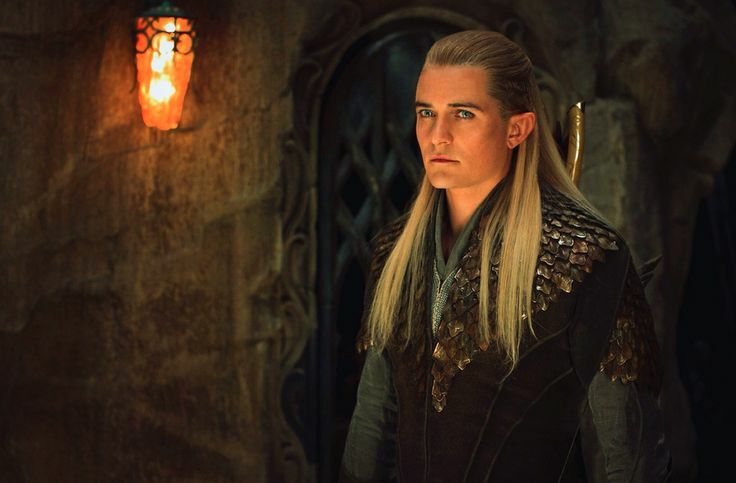 Thranduil disapproves of his son Legolas’ (Orlando Bloom) “partiality” (perhaps love?) of Tauriel (Evangeline Lilly), the captain of the royal guard. There is no love lost between Thranduil and Thorin (Armitage), since the elves didn’t come to the dwarves’ aid many years back (when the dragon attacked). I loved the cut-down/insult scene between Thranduil and Thorin; Richard said was his favorite bit of acting in DOS. As I said before, great acting is the eyes. We can see the hate/distrust between the two leaders, and their races, displayed here. On Twitter (and beyond), some book readers commented “Why is Legolas here? He doesn’t add anything. He takes away from Bilbo’s story.” Since I haven’t read any of these books, I can’t comment on that aspect. Legolas gets some cool action moments (as in the LOTR films), but doesn’t make a big mark otherwise. Tauriel, not in the book, is a nicely-developed character. She’s quick to act, a tough fighter, but also caring. Tauriel wants to help the dwarves along on their quest, especially when they are overrun by orcs. Some people didn’t like the (potential?) romance between Tauriel and Kili, but I thought their scenes were very well-done. After a while, I got tired of all the action sequences! 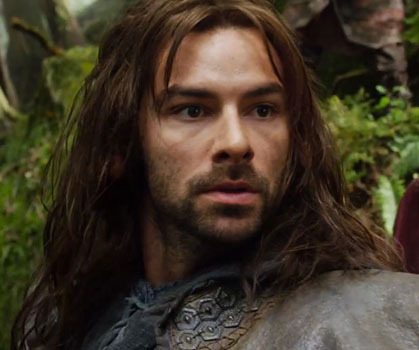 Aidan Turner (aside from being handsome/likeable) is a good actor, I realized. 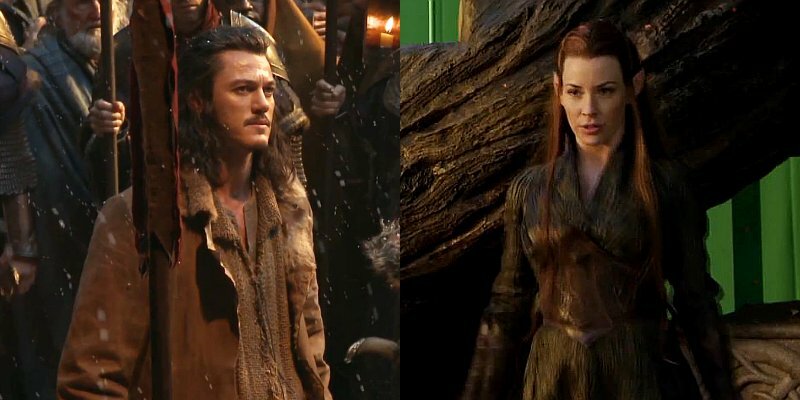 The human, Bard the Bowman, was a highlight in this film (even more that Tauriel). Luke Evans has a very strong voice and lovely (Welsh) accent. I loved his scene with Thorin at the foot of the mayor’s house. Both men have fallen from what they were born to, we learn. Bard’s kids are very cute/sweet, don’t you think? The two girls are not professional actors; they are daughters of James Nesbitt (who plays Bofur). When orcs attack, they are very stunned, but Tauriel and Legolas come to the rescue. Tauriel applies an herb, found by Bofur, to Kili’s leg wound and says an elvish prayer. Bilbo figures out another riddle, allowing the company to see the door to Erebor. Hmmm… why did Thorin give up before Bilbo? Some viewers wondered this. Armitage shines in the (quiet) scene that follows- he’s feeling like more of a king. 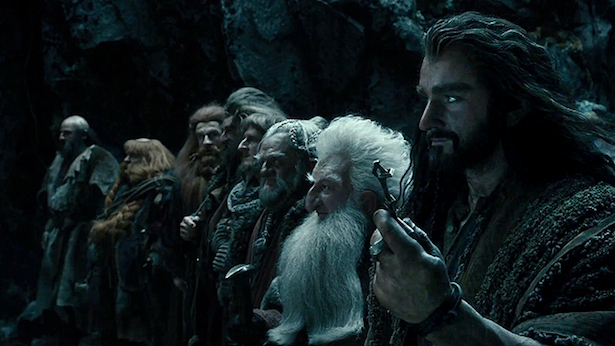 Sidenote: Some viewers enjoyed the fact that Thorin’s voice was not as gruff/deep as in AUJ; it was more natural. Since Richard has such a wonderful voice, why change it? 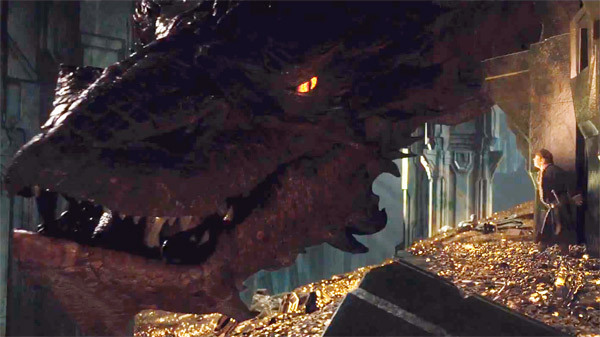 Yes, Smaug is very big/impressive, as I heard! Cumberbatch worked two weeks on the voice (which is fabulous) and the motion capture (as Andy Serkis did with Gollum). In effect, the dragon’s expressions resemble his (to some extent). Bilbo is scared, so he stays calm and flatters the dragon, while the dwarves go about their plans. However, the molten gold doesn’t kill Smaug, and he flies off to attack Laketown. Awww man, we have to wait another year! Get in the holiday spirit w/ these fun items!